This is a fast paced, quite entertaining adventure novel, which attempts to maintain a careful balance between action, intrigue and comedy, with some success. 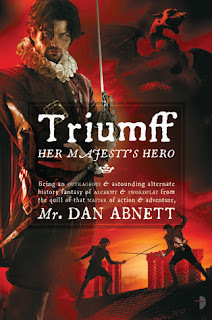 Dan Abnett is perhaps better known for his forays in the Warhammer franchises, where he produced quality work with dark and sometimes complex themes. The text is less dark here, but the writing remains of a good calibre. Glancing at the cover image, you might be forgiven for thinking that this is a novel of historical fiction - and in one way it is - the setting of the book is an alternate history. But the style ofthe book owes more to Defoe and the Three Musketeers than anything else. 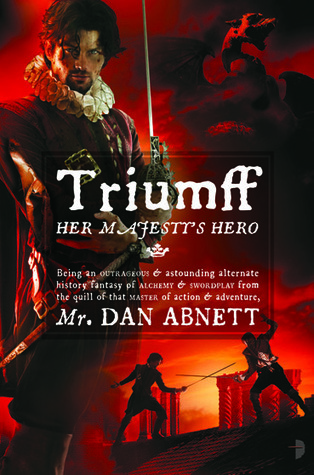 Triumff, our reluctant hero, stumbles from crisis to crisis with only a ready wit, carefully maintained aplomb, and a swiss-army-sword to preserve him...and it works very well. The characterisation is a little thin on the ground, as the text relies more on events - characters initiate sword fights, hatch plots, and make outrageous puns, but with the speed of it all, it's hard to get under their skins. The humour does come thick and fast, including amusing explanatory footnotes (which owe more than a little to Pratchett), but also some excellent wry dialogue, the aforementioned puns, and some entertaining physical comedy. I found myself chuckling every page or so, though some of the efforts fell short of the mark. Despite the humour, I felt like the focus of this book was always tightly set on the efforts of our hero (and his merry band of misfits) to thwart the machinations of a suitably mysterious villain -as mentioned above, the swashbuckling is done at a fast pace, and it sometimes becomes a bit breathless - but never, ever fails to entertain. This feels to me like the equivalent of a summer movie blockbuster - silly, action packed, and a great deal of fun, and absolutely no effort to read. It also is extremely difficult to put down. Not `high art' literature, but an excellent popcorn book, which does what it sets out to, despite some flaws, and which I, despite those flaws, thoroughly recommend. Well worth the read - especially if you just want to turn your brain off and enjoy it! 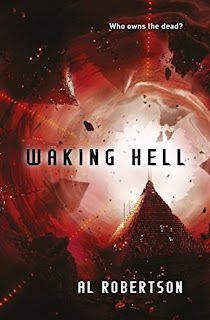 Waking Hell is the second in Al Robertson’s series of sci-fi novels that began with Crashing Heaven, centred around the last enclave of humanity - Station, a vast satellite rolling above the atmosphere of a ruined earth. The world of Station has seen some changes since the end of Crashing Heaven. The “Fetches”, the avatars constructed from the virtual selves of the recently dead, are now an active population. Once seen as little more than recordings, they’re now persons, as it were, and dealing with both acceptance and prejudice. Station itself seems the same – a gently decaying object under constant reconstruction by its nominally benevolent, somewhat manipulative AI rulers. One of the lovely environmental touches is the ubiquity of the ‘Weave’, which modifies the environment with a virtual overlay, depending on the socio-economic status of the individual. All of the characters are weave integrated in some fashion or other, and watching their environs shift virtually over a standard base is rather interesting. This is a world that carries an aura of a long past about it, but also one where everything is malleable. Where the world you see and here is something which you can change – but also one which you don’t control. The creaking corridors of Station are book lined studies and cramped utility rooms simultaneously – and both are accepted by all concerned as equally real. Into this world, already built on an ever-changing selection of the virtual and the physical, steps Leila. She is a Fetch, one of the dead of Station, given life as a virtual presence – as real, in a world as virtually dependent as Station, as anyone around her – and occasionally more so. Leila is a survivor, a woman piecing herself back together after a trauma. Robertson shows us that in her actions – in the tight bonds she has with her friends, and in the caution with which she treats others. Leila is also partially defined by her love for her brother, Dieter – she has a connection there which is difficult to break. She’s fiery, and if sometimes off balance, remains plausibly competent. When she staggers, it makes sense, and when she falls, we know why, empathise, and feel her pain. If she’s not the typical action heroine, she is entirely her own person. The drive she has, and the desire for stability, the curiosity and the capacity for love, all feel very real. Her enemies do so as well, though from a slightly different angle. She struggles with antagonists whose motives are, at least initially, something of a mystery. But there’s a sense of menace there, a cloak of anonymity and relentless, implacable violence, a feeling of conformity for body and soul. Without getting into spoilers, it’s hard to discuss them here – except to say that the ideas that they present, in one way or another, are perhaps more terrifying than the individuals themselves. I was disturbed often, and delighted to be so, when the villains were upon the page. The plot – well, it’s a solid bit of work. It starts a little slowly, bringing us up to speed with the current situation on Station gently – and in a way that would make it accessible to a new reader. But it quickly follows that up with several bangs – as Leila and the reader find her world turned upside down. There’s a sense of the detective novel here, of delving into hidden pasts, a sort of technological Indiana Jones blended with Sam Spade. The action is fast-paced and kinetic, and the surrounding scenes are fascinating insights into the characters and the world, and between them, they more than suffice to keep the pages turning. If you already read Crashing Heaven, then this is a great opportunity to see more of Robertson’s world. 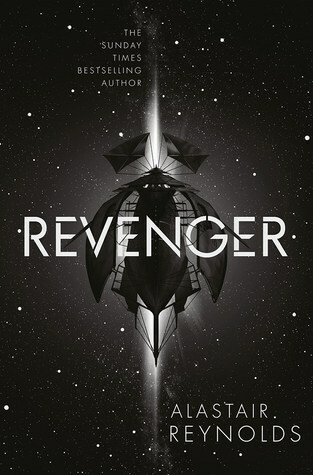 If you’re a new reader, this is an excellently crafted sci-fi thriller in a unique world, and it will reward your attention. 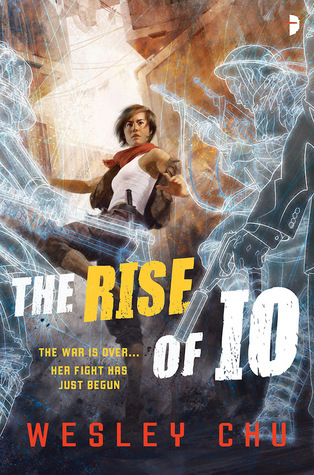 The Rise of Io is the first in a new science-fiction series by Wes Chu. It takes place in the same universe as his rather good ‘Tao’ novels, though in a different locale and with a different cast. The setting is, broadly, the world after a devastating war. Two alien factions, living amongst humanity for millennia, became visible in society and started a world-spanning conflict. We don’t see that war here, only the aftermath. Societies are still in place, there’s social structures, democracy – it’s not a world broken beyond repair. But in the interactions of those a generation later, the child-survivors of the conflict, in their loss, their pain, and their scars, we can see a little of the broader context. Most of the narrative, though, takes place in a part of Gujarat, India. The city in which the story takes place is teetering on the edge of the demilitarised zone – with echoes of Casablanca in its thronging populace, and in the shifting sands of influence, corruption and power that are associated with it. This is a city of highs and lows – where a pre-eminent politician can live in a confined splendour, and where urchins and street gangs are living their lives inside of shipping containers. We do spend rather more time in the latter locale – “Crate Town”, as it’s known to the locals. It’s a bustling hive of scum and petty villainy, where anything can be bought, for a price. It’s got an energy about it, and a sense of community, warped as it is, that makes for a strangely charming, if dangerously alive, locale. From a character standpoint, our main focus is on Ella, a small-time con artist and general youthful troublemaker, and the titular Io, an alien who has survived a long time, typically by keeping their head down – and occasionally making rather impressive mistakes. Ella is feisty, defensive, and has a tendency to speak before she thinks – which has often comedic and occasionally unfortunate results. Her fast talking, take-no-prisoners attitude is refreshing to see on the page. It’s especially intriguing when paired with some wonderfully mercenary instincts and an attitude which keeps an eye out for number one in any situation – though with enough cracks in the façade that she’s not entirely selfish. In any event, Ella talks a good game, and definitely one which is bigger than she can actually back up – but she’s easy to sympathise with, a charming rogue with a bit of a past, and a firm view on seizing the future – with as little risk as possible. Io, on the other hand, begins the text as the voice of authority; fans of the Tao series will see echoes of Tao here, in a Quasing getting to know their human host. But Io is a more cautious creature, one which has known disappointment, and is determined to get what it feels like it’s owed. Io is perhaps more caustic and demanding, and less people-friendly than other Quasing in the text; it has a delightful focus on standing, and less compunction about manipulation than others, as well. But for all that, there are cracks in Io’s façade too – a sense of guarded friendship between Io and Ella is matched by actions both take on the other’s behalf. Io certainly grows within the text, and watching it dance with Ella, like two cats settling a territory dispute, is delightful . The plot – well, there’s elements of the spy novel. Ella is living in hostile territory, keeping her head down, slowly acclimatising to being the host for an alien and snapping the odd surveillance photo. The narrative cranks the tension right up, as Ella is drawn further into a dangerous world, largely unsupported apart from Io – and both are unsure whom to trust, including each other. But there’s a lovely coming-of-age theme here too, as Ella gets a chance to be something other than she is – but fights back, asking why what she is, in fact, is so terrible. The clash of class and expectations is well drawn, the fiery Ella a constant match for the cool and focused Io. There’s enough action in here to keep the pages turning – the author has a gift for putting together fast-paced kinetic fight scenes, which made me want to jump out of my seat. In the end, this is an excellent novel , based off a core relationship between interesting, well-drawn characters, in a vivid environment. That it has enough chase scenes and hand-to-hand combat to start a movie franchise is just a bonus. If you’re looking for your next sci-fi thriller, then I’d say look no further. 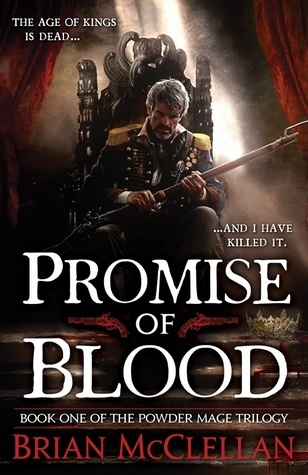 Promise of Blood blends several different world-tropes together, and in doing so, creates something unique. The largest part of this mixture is a political system similar to that of Napoleonic Europe, with large, feuding nation states, each manoeuvring to displace and subjugate the others. It's nice to see something other than the usual feudal framework that often informs fantasy. Rather than knights, men-at-arms and cheery peasants, we have muskets, artillery pieces, and grimy, aggravated infantrymen. The world, as presented, is politically and socially in flux. The second part of this mixture is magic, and the sources of magic. The latter becomes clearer as the narrative progresses, but the former is obvious immediately - magic is real. Magic users are powerful, often brutal, and used to getting their own way. In a twin to the social and political upheaval above, the traditional magical power blocs are being upset by the rise of magic users fuelled by gunpowder - a new type of wizard, for a new age. Gandalf and the Hobbits this is not. Over the course of the narrative, we see a lot of the brutality, grime and worms-eye view that informs a lot of the newer fantasists these days - authors like Joe Abercrombie, Miles Cameron and Mark Lawrence. But there's also a lot of recognisable tropes from older fantastical styles; much like the world created by the narrative, this blend of styles is well done, clever, and easy to read. The reader is given several narrative strands to keep their attention; one of these is especially interesting, as it presents a murder investigation. Whilst other points of view cover quests and grand political restatements, this investigative, probing style is atypical, and gives a more grounded view of the unique world. Unfortunately, whilst this is a relatively novel viewpoint, it feels a little underdeveloped alongside the more typical views - as the text draws to a (inevitably cliff-hanging) close, the investigation thread rushes into a conclusion - it's still well done, I just wish there had been time to explore it more fully. Overall, this is sharp, clever fantasy, in a unique and well written world. There are still some rough edges, but the prose is eminently readable - though the reader should be ready for sprays of blood and guts, unflinchingly described alongside gunpowder and revolution. Taken on those terms, this is an excellent book, and I recommend it strongly. 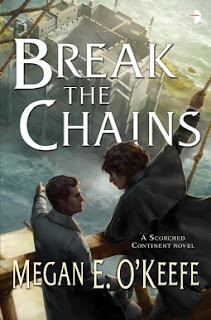 Break the Chains is the second in Megan O’Keefe’s “The Scorched Continent” series. I took a look at the first one a little while ago, and felt that it had a lot of potential . The sequel bears that out, bringing some damaged and delightfully convincing characters into a vividly realised world. We’ve seen parts of the Scorched Continent before, but this instalment focuses on new environs – in particular, on a maximum security prison. The facility isn’t a day at the beach – it’s designed to hold prisoners whom the government may one day find useful, and so there’s a range from political agitators to bloody-handed killers. The surrounding environment, an island of prison-worked agriculture surrounded by rampantly shark infested waters, carries echoes of Alcatraz. The hallways seem to exude a sort of slowly boiling menace, a sense that control is allowed here, rather than assumed. In amongst casual brutality, incompetence and authoritarianism, there’s some signs of friendship and humanity. O’Keefe gives us a space filled with the potential for violence, where social groupings form and bonds strengthen – or break – under pressure. There’s some exploration of the outer world as well – one of our protagonists spending time infiltrating a military post, or on a deserted island in the middle of a darkening sea. It’s nice to see greener pastures, after the brutal-seeming deserts of the first volume, and the variety is sufficient to keep things interesting. From a character standpoint, we’re back with Detan, the charming, often unlucky rogue from the first book. He’s still haunted by the ability he has to cause large explosions using a fairly pervasive magical material, counting the cost of his actions, and carrying the burden of the blame. There’s a sense of self-pity to some of this, as Detan struggles to come to terms with an aspect of himself that he’d rather pretend didn’t exist – but the portrayal of a man on the edge, seeking some sort of escape and redemption, driven to action but terrified by its consequences, is very well done. The other part of the duo is back as well. Tibs serves as Detan’s everyman, a companion there to help Detan keep himself under control. Tibs suffers the consequences of his own actions, a raw take on post-traumatic stress disorder coming through in his actions with, and sympathy for, Detan. Alongside the dynamic duo, we spend more time with Ripka and the charmingly named “New Chum” as they infiltrate the prison. The latter has more fleshed out backgroundover the course of the text, including a few surprises. There’s a deadliness and a gentleness in his words and deeds which work wonderfully in contrast. Ripka remains her usual self, with an iron sense of rectitude, struggling to blend into a prison population which is rather less full of moral certainty than she. She’s a delight to read though – calm, focused, but humanly prone to failure, to misjudging a situation and then competently dealing with the consequences. If Detan and Tibs are the freewheeling section, prone to great highs and lows, then Ripka and New Chum are the professionals, working their angle with care and talent to turn things around. They are, as ever, ably assisted by an excellent supporting cast, including other users of the magical ‘Selium’, a raft of imperial troops, and a prison population and staff ranging the gamut between violent psychopaths and charming professionals. There’s a great deal on display here, and it’s great to feel the characters from the first volume being fleshed out, as we discover the layers of their personalities, their hopes, fears, dreams and nightmares. The plot – as ever, no spoilers. It starts a little slowly, but that’s just a gentle burn. By the mid-section, as both pairs of heroes are working at their goals, there’s a sense of danger hanging over every word, a tension in each picked lock and duel. That tension reaches a crescendo by the ending – the reader left on tenterhooks. I must confess that I tore through this instalment, and I’m really looking forward to the next one. Anyway, is this worth reading? I think you’d need to read the first book in order to fully appreciate it. But there’s a sense of more fully realised potential here – the characters are growing, and feel like they have both depth and a decent emotional weight. The world – there are hints of a far larger context and history in the background which I hope to see further explored ,but what we’ve seen is well-detailed and intriguing. The plot isn’t full tilt all the time, but manages to find a delicate balance between frenetic, explosive action, and quieter contemplative moments. In the end, I’d say if you enjoyed the first volume, then this one will reward a reading – it’s an interesting piece of steampunk fantasy, and I’m interested to see where the series is going to go next. The Guns of Empire is the fourth in Django Wexler’s Shadow Campaigns series – a character driven work of military fantasy. 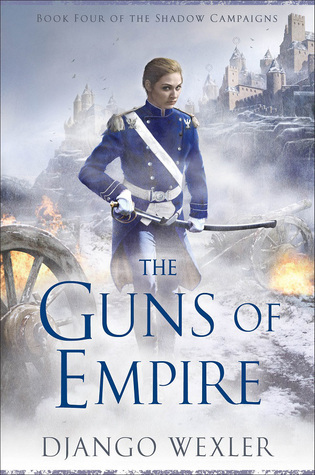 The Guns of Empire is set in a world with echoes of the Napoleonic Wars about it. There’s a lot of the gentle pageantry of nineteenth century brutality – colourful uniforms and shining steel; but there’s also a lot of the harder reality – blood on the edge of swords, cannons destroying ranks of soldiers, the horror of the wounded. Alongside this there’s the emotional closeness of warfare. The willingness to do anything for friends and comrades. There’s something else as well though – there’s a tinge of magic floating through the air, more than a hint of Sharpe With Sorcerors. Whilst the armies march, there are those on all sides who carry seemingly supernatural powers, having spoken the names of otherworldy entities. Some are driving the agenda of the conflict, and others are simply trying to survive it. This is Wexler’s world, one where the supernatural is real, seething beneath the surface. Where a church exists with a hidden mandate to contain “demonic” entities, and is willing to risk anything to do so. Where a newly formed constitutional monarchy is struggling to stand on both feet against neighbours terrified of the contagion of revolution. Where there’s always more than one agenda, and where the world can change on the knives and conscience of a supernatural assassin, or on the tramping feet of marching regiments. This being the fourth book, most readers will be familiar with the broad strokes of the world, and indeed the characters, most of whom we’ve tracked over the last three books. Still, there are some changes here. Winter, our every-woman soldier, now heads up part of the largest formal army assembled in the modern world. Watching her sweat over this responsibility, and seeing how she deals with the potential for failure, as well as the adrenaline of success, makes intriguing reading. She is also, of course, struggling to deal with the consequences from the end of the last book, when one of her key relationships was shattered in the flash of gunpowder. This is Winter slowly being ground down by the demands of her position, grieving in a way, and struggling to fully articulate a sense of self. As the narrative begins, she’s clearly drowning, and we’re shown that as a fully realised portrayal of someone at the end of their tether. Winter is joined by other favourites of course. There’s Raes, sometime revolutionary and now also the reigning monarch of a country at war. Much like Winter, she’s coming into a new sense of herself, becoming both the symbol and an independent force alongside that. Raes’s movement toward being the authority figure that her people need, and that circumstances demand, has been a joy to watch over the preceding texts, and that journey continues here, as she begins to clash with other active powers in the world. Part of her journey is in a growing relationship with Marcus D’Ivoire, a career officer with certain views on honour. He’s struggling between his loyalty to his Queen and country, and his personal loyalty to Janus, the general to whom he owes everything. That conflict within Marcus is also symbolic of a wider one, as conversations about military, royal and government authority begin to circulate, alongside the necessity of expediency during a continent-spanning war. Marcus has always been defined by his loyalty, the knight-errant – and watching that loyalty tear him in two seems both perfectly correct and utterly terrifying. It’s a wonderfully done portrait of a man on the cusp of some very hard decisions – and that’s an area the text doesn’t shy away from. We get to see more of the supporting cast too, of course, including some time with the ever-enigmatic Janus. The villains remain convincing, and it’s difficult to say, when given a view of their motives, whether they’re even in the wrong. Some of them, of course, are wonderfully, skin-crawlingly malevolent, and feeling that pour off the page is an absolute delight. Plot-wise, there’s rather a lot going on here. If you’re here for the battles, Wexler provides them with his customary focus and panache. There’s blood, grit and gore aplenty, to go along with heroes and cowards – and botches and triumphs that look set to change the face of the world. But there’s a larger context in play too, keeping you turning the pages – the conflict between the nation of Vordan and the church is a branch of another conflict, over the role of supernatural entities in society, and that struggle is at least as vital as the one on the battlefield. It’s gut wrenching, tense, compelling stuff. If you’re reading this, the fourth book in the series, then I can safely say that all of the things you enjoyed feel like they’re still here – but the stakes are getting higher, and it’s getting harder to put the book down. Is it worth reading? 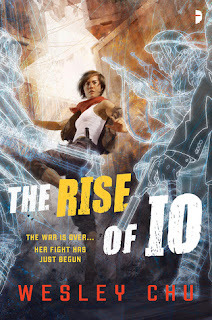 If you’re a new reader, go back to The Thousand Names, the first in the series, and try out a unique blend of warfare, magic, politics and personalities. If you’re coming from The Price of Valor, then yes – pick this one up. It’s not going to let you go once you do. 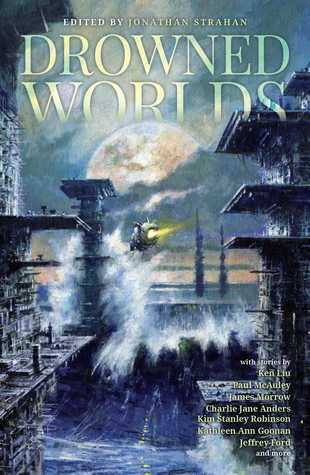 Drowned Worlds is the latest in a series of Strahan-edited anthologies. In this case, it gathers together a swathe of diverse writers, to discuss what happens to the world after sea levels rise. There’s a great selection of stories here, with moods ranging from the melancholy to the darkly comic, with stopovers in the mythical. The settings vary as well. Though the theme of changing climates and rising waters is always there in the background, the timing shifts – in some cases, the narrative is at the crest of the disaster, teetering on the brink, wondering how we’ll cope on the downward slope. In others, the great catastrophe that can break civilisation has already been and gone, and the story walks through the aftermath, asking what humanity has become. As an example of the latter, there’s Catherynne M. Valente’s “The Future is Blue”, with remnants of society cast adrift on an island of rubbish. The garbage itself has been sorted and segregated, and now the people live in the scattered leavings of the previous world, using batteries for power, and less useful salvage as a building material. But there’s a romantic certainty working through that society, a vision of land, just out of reach, somewhere over the horizon. It’s a society with a dream of permanence, a sense of its own impermanence, and a desire for something more. It’s also something recognisably human – noble, idealistic, corrupt, petty and venal, all at once – a thriving microcosm of humanity living in our own remnants, but no less human. At the earlier end of the spectrum, there’s Christopher Rowe’s “Brownsville”, tracking the rise of floodwaters in a world with a Pan-Caribbean rail system. Here the rising waters are a ticking clock, the protagonists looking for a way up and away in their sealed system; again there’s a strength and a sense of genuine humanity here – the two central characters tied together by their affection for each other, as well as by desperate circumstance. There’s a sense of a society already build to handle massive climate change, one which now is itself disintegrating – humanity becoming less of a force in control of nature, and instead, by necessity, a component within it instead. The other stories have a similar level of diversity, from Kim Stanley Robinson’s exploration of religion, identity and financial colonialism in “Venice Drowned”, as a tour guide helps some tourists pull treasures from Venice’s now submerged churches, to Sean Williams “The New Venusians” – here the discussion is around the environment and change. Venus is pushed into a catastrophic climate event, becoming more earth-like as a result, the mists condensing into seas. This does, of course, lead to the utter destruction of the existing ecosystem. There are meditations here on the right by which humanity meddles with larger systems, and discussions of the consequences – wrapped in a bittersweet tale of growth and the delicate relationship between a teenager and her grandfather. What they all share is a sense of humanity, a feeling that we are in ways mysterious to us, both greater and more monstrous than we are perhaps prepared to admit. These are stories exploring the way that people are, and the way in which they will adapt and change in any circumstance – all to the backdrop of rising waters, melting ice caps, and the destruction of the current paradigm of human existence. Each author approaches that paradigm shift from a different direction, but humanity is at the core of their work – and the collection as a whole is an intriguing meditation on where we’ll go next – and what we’ll do once we get there. Is it worth reading? If the theme appeals, if broken worlds and submerged cities tweak something in you, then yes, absolutely. If you want to look at the way humanity could be in a changed or changing world – then again, yes. There’s a lot of fiction on the end of the world out there, but this is a strong collection, with a lot of interesting things to say, and it’ll reward a careful reading. 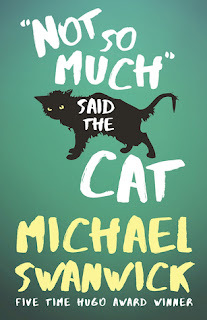 Not So Much, Said The Cat is a collection of short stories from Michael Swanick. There’s an eclectic selection available here, from time travellers on a ticking clock, to literary characters debating the nature of their existence, into discussions of the nature of culture and resistance in a cheerfuly conquered humanity. The Dala Horse, a land which has been made mythical, which lives inside the tropes of myth through the protagonist – but carries the signs and scars of once being something outside of a story. There’s a wonderfully baroque and horrifying future New Orleans, as part of a Darger and Surplus story – a torrid metropolis, filled with men turned to mindless drones by a drug as punishment, set to serving masters in the gaily coloured, thriving Quarters. Swanick builds his worlds with equal care, from the twisted dreamscapes and enervated passion of “The House of Dreams”, to the barren grime and ferocious personal energy of “Libertarian Russia”. Each is distinct, vivid, different – but all seem plausible and believable – even in circumstances where we’d rather not believe these worlds could exist. The characters are similarly well realised. The constraints of shorter fiction mean more dependence on the reader to fill in blanks – but here it never really feels like there are any. The alternate pushin presented in one story is seen constrained, quietly present, struggling with an affection for a language. There’s the confused, struggling relationship of a man and a centipede-esque alien in “From Babel’s Fall’n Glory We Fled” – this in itself a fascinating study in differing cultural viewpoints, The memoir of love, grief and loss that is “An Empty House with Many Doors”. Each give us people to follow, and in the space available, make them individuals, with thoughts, needs and feelings (oh, so many feelings). Swanick is on top of his game here, giving us characters which feel , who need, who hurt. Some are more archetypal than others, but each was a delight to read. The plots are, largely, excellent stuff. There’s what feels like pure fantasy, in some cases merged back into hard sci-fi. Some of the stories are more science-fiction, as well – it’s a broad mix, something for everyone. What doesn’t change is the sense of urgency, of compulsion, turning each page at two in the morning to see what happens next. Swanick’s prose flows. It’s intriguing, remorseless, delicate, wonderful stuff – each sentence carefully structured to drive the story, each narrative laid out to claim the attention of the reader. This is a book you can more than happily read in elegant, bite-sized chunks – if you’re willing to put it down at all. Is it worth reading? I’d say so. There’s some great material here. The sheer breadth suggedts parts will misfire for some readers, but there’s enough here that everyone will find something to enjoy. The ideas are innovative and intriguing, elucidated by characters you’ll care about, however briefly, in well-crafted worlds. So yes, give it a read. 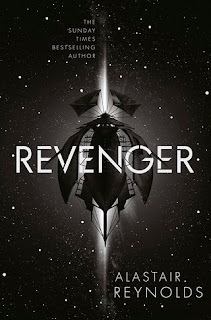 Revenger is a new standalone novel by Alastair Reynolds. Set in a panoply of worlds and habitats close enough together to make travel between them if not routine, at least plausible, it has an atmosphere reminiscent of The Count of Monte Cristo, a tale of obsession and revenge missed with a coming-of-age story. The grand science fiction concepts Reynolds is famous for are still here, lurking in the setting – but there’s a strong protagonist over the top, with a personal narrative that invokes the setting, but isn’t subsumed by it. That said, the setting is an intriguing one. All the worlds appear to be artificial, in some fashion or other. Some are explicitly so, roving habitats and pressurised tin cans, circling in and out of the wider community of worlds. Others are more cunningly crafted, terrain and cities wrapped around artificial gravity generators. Alongside these habitations, ranging from city-sized worlds to larger conurbations, there’s the matter of ‘baubles’ – worlds and constructs which are shielded from entry, but seem to open under their own criteria, revealing whatever treasures lie within. Treasures is the key word here, as well. This federation of artificial worlds, now inhabited by what appears to be humanity, or a close analogue, already have a long history. A history of warfare, occupation, technological advance and mass extinction over millennia – and artifacts left over from all those millennia are cached in the ‘baubles’, ready to be picked up for an extensive profit, alongside precious metals and other negotiable currency. This makes diving into baubles a daring, risky, sometimes deadly profession – those who do so acting as a clique of space-borne Indiana Jones-types. From a character standpoint, we’re initially focused on the Ness sisters, Adrana and Fura, and their conflicts both with each other, and with the outside world. They’re constrained somewhat by the pseudo-Victorian social milieu in which they live their lives, and break away, somewhat, becoming part of the world of bauble exploration and space travel. The sisters are interesting studies – one, initially impulsive, slowly becoming more taciturn in the face of consequences outside her control. The other, the younger, begins as something of a naïf. Watching her transition through the text is intriguing – a shift from the gently baffled, to the competent and friendly, to the white-hot, focused rage of someone dealing with circumstances outside of the norm. There’s secondary characters here of course – crew members, both antagonistic and friendly. A localised villain, in some ways unpleasantly familiar and deserving of comeuppance. There’s a larger villain too, at least initially faceless, an individual driven by forces outside of the view of our heroes. An elemental force of ruin and despair. Each of these, Reynolds captures perfectly, giving the reader enough to see them as people, but leaving us to our own devices to fill in the blanks. Still, it’s the initial sisterly relationship, and the slow burn from acceptance into revenge, the way a personality can be shaped or even warped by circumstance, which is on display here – and it’s absolutely pitch perfect, and marvellously convincing. The plot – there’s a broader metaplot in the background, which I think was worth more attention than I had perhaps given it. But the story of a personal journey, of development in danger and trial, of a gradual Nietzschean shift, as the hunter becomes the object of the hunt – that story is an incredibly compelling and intriguing one, in a subtle and complex world, staffed by plausible, characters. The red hot iron of vengeance runs off of every page, and makes it very difficult to put the book down – indeed, I could not do so, and finished at 4AM< with the lights out. This is a wonderful piece by Reynolds, very much worth your attention. It has a plausible and fascinating world, cloaked in his usual well-researched background. It has well-drawn, intriguing, often horrifying characters, pouring themselves onto the page in the service of a thoroughly page-turning plot. In short – it’s an excellent, gripping piece of work, and I commend it to your attention.